Who hasn't dreamed of having a peaceful retreat somewhere off in the wilderness? Moving away from civilization, you can reconnect with nature, understand yourself, and discover a greater depth of life. Many people each year choose to move away to remote places to live lifestyles that provide a sense of grounding and self-reliance – if you're planning to be one of them, have a look at these homes! 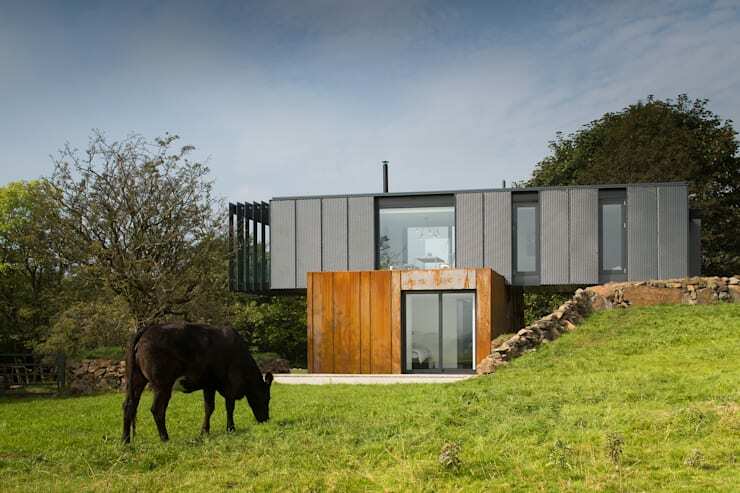 These architects have designed these houses to live within their natural surroundings, instead of competing with them, providing an ideal setting for attaining a healthy peace of mind. Simple and warm, this cottage is an excellent example of how it is possible to adapt to the terrain, taking advantage of the slope in order to provide prime views of the winding river. Minimalism is cultivated in this design, which exhibits a measured, neat and homogenous wooden exterior. Stained a shimmering black, the surfaces of this structure reflect the sun, helping this home to change its look in harmony with the sun and seasons. When you have a forest at your front door, it's impossible not to feel free. 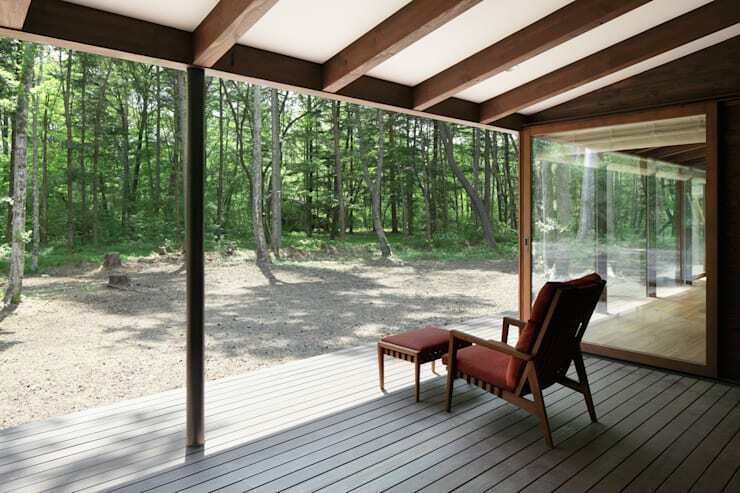 This home establishes a very personal relationship with nature, as sliding windows can be moved aside to remove any sense of a barrier between the indoors and the outdoors. This property cultivates a very exotic and tropically-inspired style, with plants sprouting energetically from various spaces in the home's design. Wood, stone and glass characterize the building itself, which offers a wooden interior glowing with a warm golden light. Inside, the rooms achieve minimal separation, with a fine mirror providing a partition between the common and private areas of the home; however, you'll notice that there's really no area of the home that's truly private, as its sheltered forest location provides plenty of privacy, the natural way. 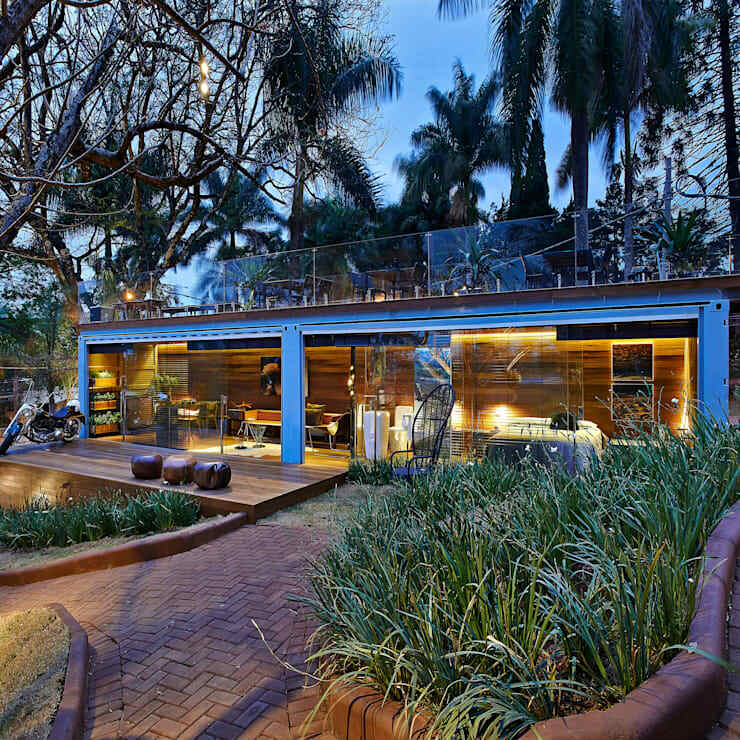 Integrated into the slope of the land, this particular house surprises by the creativity of its design. Built in blocks comprised of window and door frames, this home makes a powerful statement about upcycling! With the mound of Earth providing structure and privacy, the rest of the home is characterized by an open, light, and transparent appearance. 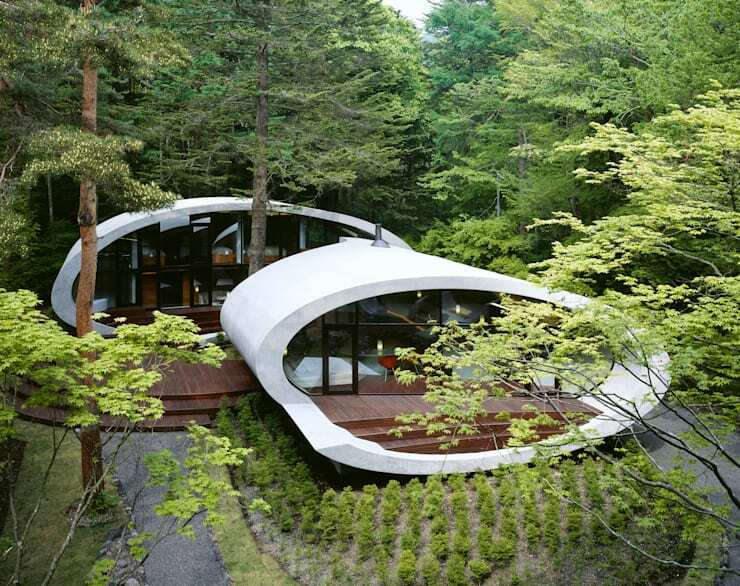 Although this may look like an alien spaceship, this house keeps things down to Earth with organic shapes, natural woods, and the incorporation of natural views into its design. This oval-shaped wonder is clearly created for admiring its surroundings! 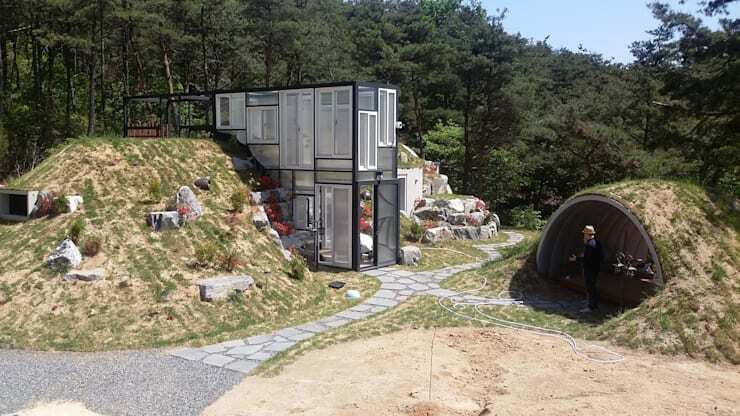 This modular home is impressive, not so much because of its size or design, but because of its location! 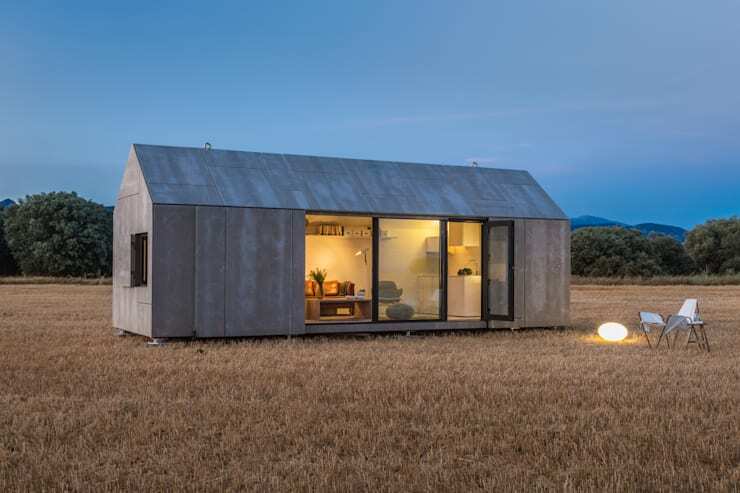 A modular home can be constructed quickly and cheaply in a variety of locations with little impact on the environment, and it appears that this example has landed lightly on its little legs in the middle of a wide open field! A miniature world within itself, this home draws a picture that challenges a typical idea of context, with an absence of landscaping, driveways, porches, and other elements that serve to anchor a house in its surroundings. Built with two overlapping blocks, the first floor rests on the ground, while a second floor block is accessible from the top of the slope. 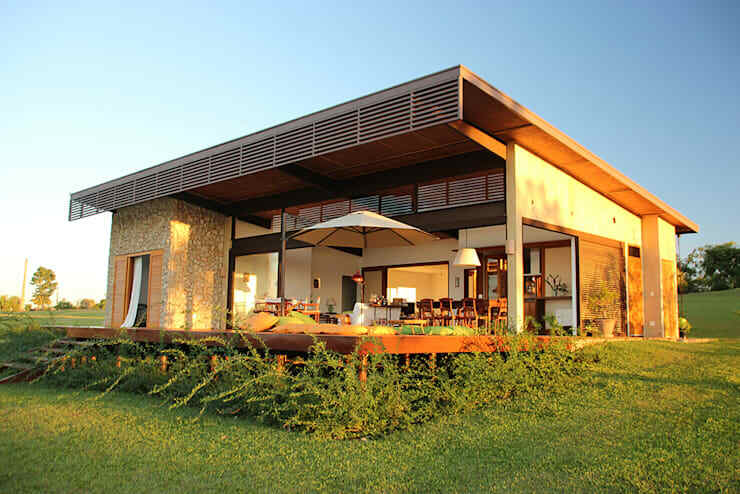 This modern structure offers a highly unexpected vision of modernity tucked away in the corner of this peaceful farm! Far from what you'd typically imagine as a 'beach house', this modern home takes the concept of a beach hut and upgrades to an authoritative, sweeping structure designed to sun itself in the tropical sun. 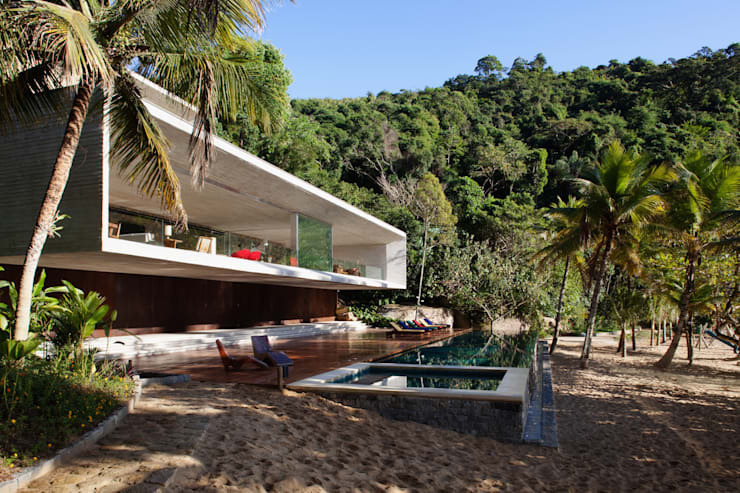 The elongated form matches the extensive wooden patio and long pool below, drawing long lines that live in harmony with the seaside horizon. 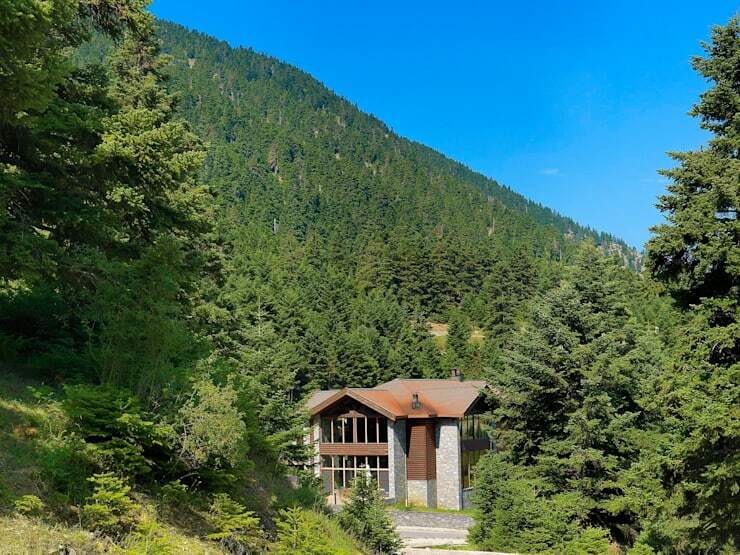 A sturdy retreat, this mountain home is tucked away quietly among the mountain pines. Thick stone walls ensure that this structure stands just as strong as the mountain upon which it is built, while warm wooden details and multiple fireplaces add warmth for cool mountain temperatures. This home takes advantage of its location in the middle of a sloping field with a large terrace directly attached to the house. Some homes offer a friendly facade as a greeting to guests – this one offers its entire interior, paying homage to the great outdoors! The simple shed roof is extended to provide a generous awning for the sunny terrace. What do you think of these rural homes? Comment below!